Ioannis Kalos, aged 65, is one of tens of thousands of children who filled the orphanages of Greece in the 1950s. The country was fresh off the back of both World War II, and the Civil War, during which time people had little money, and pregnant unwed mothers were a taboo. Ioannis spent the first five years of his life at Athens State Orphanage, before he received the news that he, together with a two-year-old girl, with no relation, had been adopted by a couple from Long Island, New York, his adopted father German Jewish American and his mother Irish American. This is when his first memories of trauma commenced. But at the end of the long and arduous voyage, there was no new happy beginning to be found for Ioannis. His adopted parents, the woman in her 30s and man aged 51, had been longing for a baby. But instead got Ioannis, who states he was rejected by them time again. Where today there are a host of checks and balances in place for adopting a child, the processes in Greece at the time were a little murky. What Ioannis does know is that in his case, and many others like it, the process was done via “blind adoption”; the prospective parents had neither been to Greece, nor met him prior, and had gone through an agent of sorts. “They paid a lot of money to get me and my adopted sister,” he says. But it was nowhere near as much as he himself would pay in the “horrendous life”, as he himself describes the conditions he had to endure – a reality he “wouldn’t wish on (his) worst enemy”. Ioannis says the first thing his adopted parents set out to do was erase any Greekness in him; a cruel endeavour. “I spoke Greek as my mother tongue and I had no interpreter. When I spoke Greek, I was beaten until I submitted to the fact that I forget Greece; forget anything that had to do with Greece. What they wanted was to erase everything before the five years of my life and to embrace their nature, and I just couldn’t do it. You can’t do that to a five-year-old – it’s a human being with his/her own mind, and our own personality,” he says. It was at the age of 14 that Ioannis was committed by his adopted parents to a mental asylum for delinquent boys. While there, he underwent a series of psychiatric examinations, which revealed to him what he knew in his heart all along. It took Ioannis three attempts to get away, making it all the way from Binghamton to New York City, close to 500 kilometres distance. Soon after he was picked up by local police, who took him straight to juvenile detention, while locating his adopted parents. They were called upon to appear at a family court – the last time Ioannis would see them. “The judge, I remember, he asked them ‘Do you want this child?’ And they said ‘No, we don’t want him anymore’; both of them said that to the judge.” Years later, when Ioannis married, his wife reached out to his adopted mother by phone when she bluntly revealed “‘The day after he arrived from Greece, I realised we made a mistake’; she said to my wife that she could not bond with me. I couldn’t believe it,” he recalls. After the court appearance, Ioannis was declared a ward of the state of New York. Over the next two years of his life, he would be in and out of foster homes until the age of 16, when he decided he had, had enough, opting to fend for himself. At this point, all he knew about his identity was that he was Greek; his adopted parents had not naturalised him, and so was still considered an ‘Alien’ in the US with no official documentation. Pre-internet days, the process of research was nowhere as accessible as it is today, and so he set out knocking on doors and making phone calls, with little success. Seeing no future for himself in the US, in a bid to get as far away as possible from his traumatic upbringing, at 20 Ioannis moved to Canada. It wasn’t until the age of 21 that Ioannis had a breakthrough in his search for his identity. He wrote a letter to the American Government, and received an envelope in the mail containing his baptism certificate from Greece. Up until that point, he had been going by the name of William Anthony Schwarz – a name he says never felt quite right. “Can you see me, a Greek, being called Schwarz? I absolutely hated the name! But the news both excited and unsettled him, he admits. Abandoned twice in his life, once at birth and then again by his adopted parents, Ioannis admits it was a debilitating childhood that followed him into his adult years. The certificate in turn raised a lot of questions; how much information had his adopted parents held from him all these years? Critical information about his identity, which could have filled some of the gaps in his life. At the time, Ioannis was not willing to confront them himself, admitting that he “absolutely hated them”, going as far to reveal that after the trauma he experienced he oftentimes found himself dreaming of killing them. With a small piece of his identity, Ioannis found himself on the road to regaining and owning the rest of his story. Along with his name, the baptism certificate also contained the address where he had been found. It was in 2000, at the age of 47, that Ioannis first returned to Greece. His first stop, together with his wife and an interpreter, was the doorstep of the woman who found him as a baby, just two weeks old. Aged 80 at the time, she was reluctant to let them in, suspicious that they were Jehovah Witnesses. But once she realised who Ioannis was, she welcomed them in for tea. After that pivotal moment, Ioannis’ hunger for answers was further renewed, but little new information was emerging. It wasn’t until 2016, when he decided to start a Facebook group, Greek Orphans Seeking Answers (GOSA), to connect with others like himself, that the flood gates to the rest of his life story would open. “My group was growing and I noticed a lot of people got their DNA done. A few of them were telling me ‘Ioannis, get your DNA done because in your case not knowing anything about your history, your only hope is DNA’,” he recalls. But he wasn’t initially sold on the idea. What would a DNA test reveal? That he was Greek? He already knew that. Plus, momentum for DNA testing has yet to take off in Greece, as it has in other parts of the world, and with no national Greek database, he felt it was pointless. His only chance would be if one of his birth relatives lived abroad – very likely given the large Greek diaspora – and had, had their own DNA tested. “So they won me over,” he laughs. It took Ioannis about a year to get around to ordering his kit, and on 3 February, 2018 life as he knew it would change forever. Within four hours, he had a response. Not only did he have a cousin, but they both lived in the UK – she in Bristol, England, and Ioannis in Northern Ireland, where he has lived for 16 years now. From there, they added each other on Facebook and photos revealed an uncanny family resemblance. “She thought ‘Oh my goodness! He looks like uncle George!’, her mother’s cousin,” he says. Eventually he would arrange to Skype with George, during which Ioannis says his wife “nearly dropped to the floor!”. “When you look at him, I look exactly like him – how I would look, when I’m 86. That’s my dad’s brother! And he cried; he broke down because he kept it secret all these years, even long after my dad died. Ioannis has since discovered that his father eventually worked his way up to become the Assistant Fire Chief of all Greece. But the biggest discovery was yet to come. 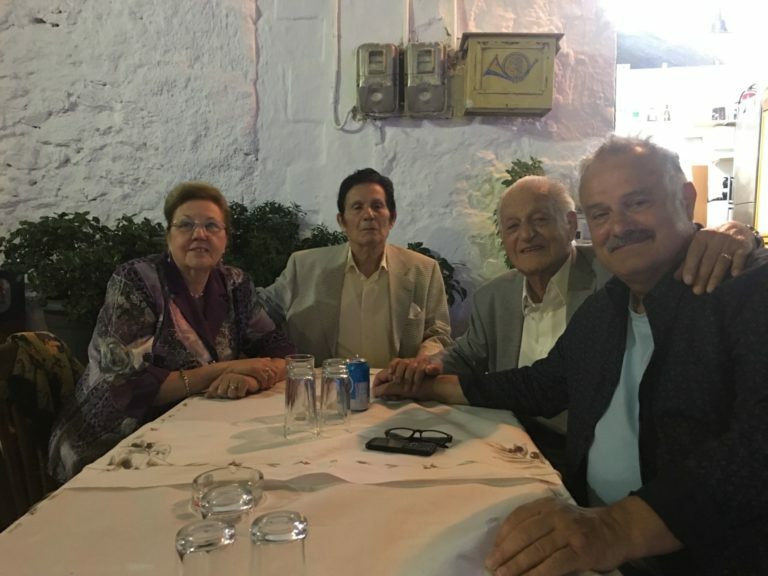 Ioannis (R) with his father’s brothers George (second from right), John (C) and John’s wife, Alice. Ioannis was informed by his uncle, that his father married in 1969, and the following year fathered a daughter. The prospect of a sister was mind-blowing to Ioannis; never did he imagine the DNA he had been debating, doubting, would bring to the fore such information. The next step was to further confirm the relation. Uncle George agreed to do the test, but it was rejected by Ancestry, after instructions were not followed correctly, and instead offered to send out a second test. That’s when he decided to go straight to the source, to ask his father’s daughter to take the test herself. “She agreed to do it. She took it, and on June the 6th the results came in and I nearly hit the roof!” recalls Ioannis, smiling. “I still remember it; I didn’t sleep that night. I text her and said ‘Guess what? You’re my sister!’ She didn’t believe it. It took a long time to persuade her,” he admits. Putting his sister’s mind at ease would mean retaking a DNA test, but this time with a Greece-based company, a process Ioannis willingly took part in to reveal the same positive results. His sister agreed to meet with him, and so he booked a flight to Greece, arriving in Athens for the second time on 27 July, 2018, this time with a greater sense of self, and knowledge of a sibling. He speaks of that night fondly, the memory fresh in his mind eight months on. She picked him up that evening and brought him to her house, where he met her two daughters – his nieces – and her mother, the woman who had been married to his biological father. During that same trip to Greece, Ioannis spent two unforgettable weeks in his father’s village of Kastania, a town in Mesa Mani, Laconia, which he describes as a “heavenly time”. He even stayed in his grandmother’s home – a surreal experience. Since then Ioannis’ sense of self has completely changed. Not only does he have a sister, but extended family – his father has another living brother, and two sisters who though passed, had children, who are Ioannis’ first cousins, many of whom he will meet for the first time this European summer. It has been a difficult road, and one that continues, with his sights now firmly set on piecing the puzzle of his maternal side of the family. “I think I will eventually find my mum. Or I will know about her. I could have brothers or sisters from my mum’s side,” he says. 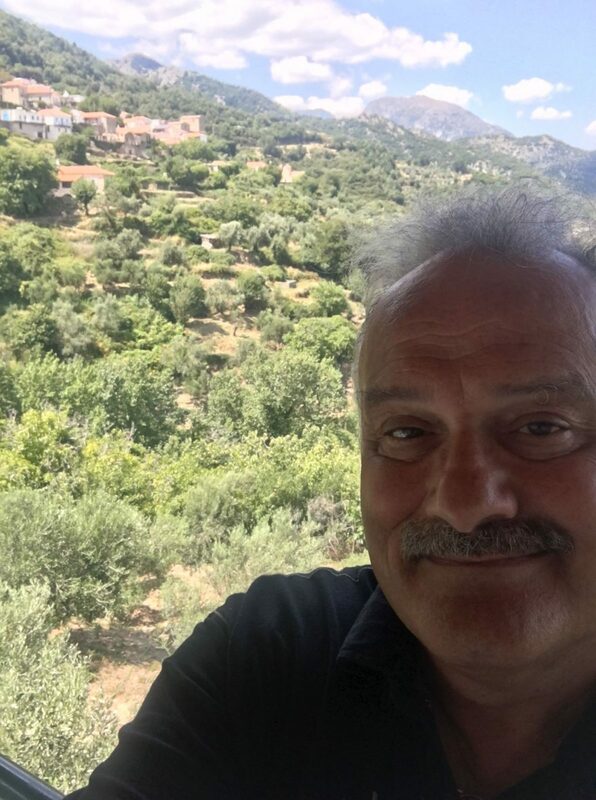 Ioannis at his uncle's house, overlooking his father's village, Kastania. 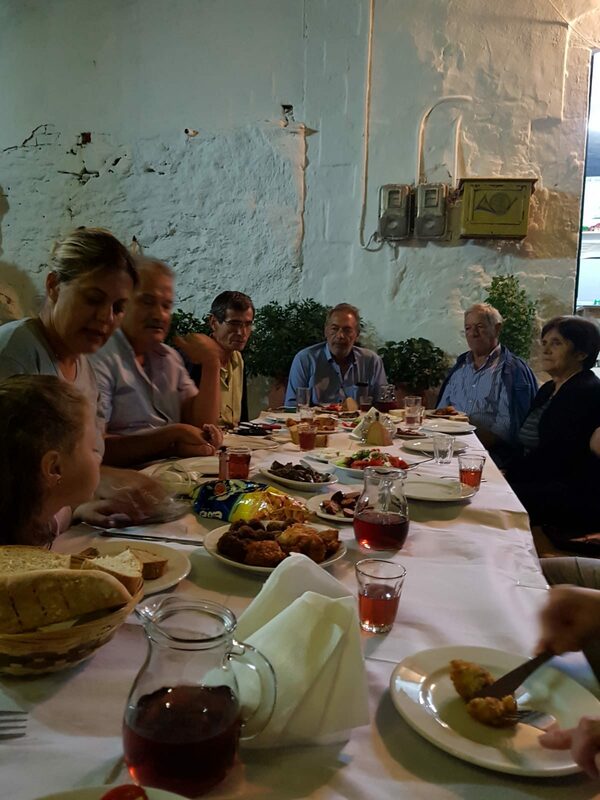 Ioannis sharing a meal with his family in his father's village of Kastania. 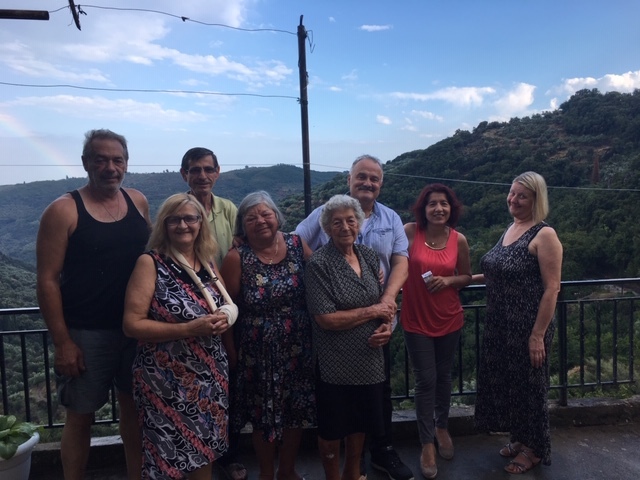 Ioannis with his aunties and cousins in the village of Melissa.